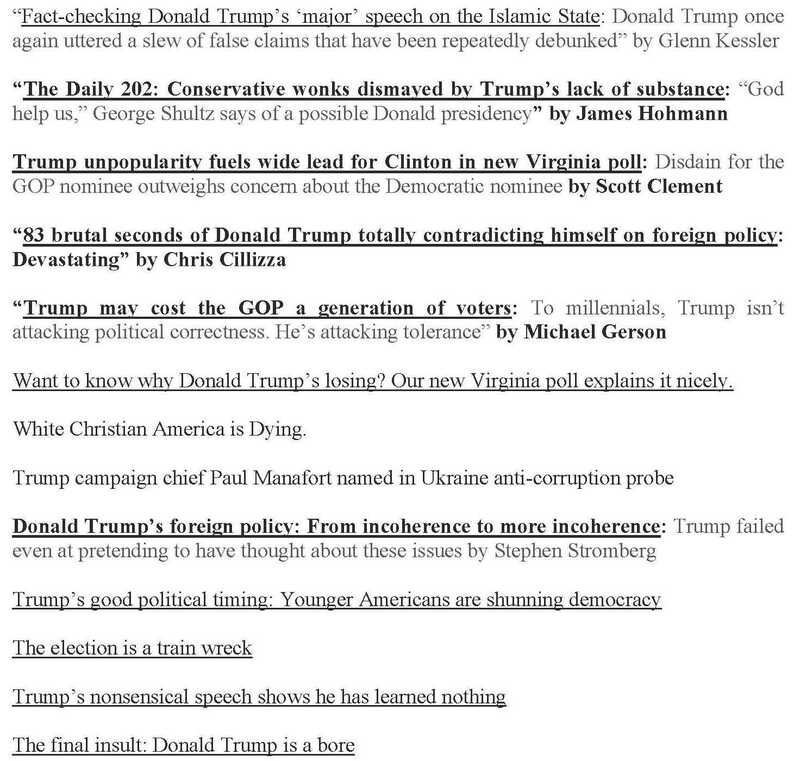 Articles from one day, August 16, in the Washington Post daily email. Included are all articles related to the election. There were no articles with Hillary in the headline included in the email. There has been some introspection among a few mainstream journalists, who have stepped back and asked themselves, have we gone over the top in our media campaign against Donald Trump? We should be cautious in attributing this to integrity, something we haven’t seen too much of in the media. But every now and again we get some nuggets of truth, even from the least likely sources; ironically, those whose job it is to bring us the truth: journalists. As one of the self-reflective articles from The Week points out, there is apparently a collective decision on behalf of the media that “any pretense of covering the campaign dispassionately deserves to be thrown out the window.” I would suggest that this is provoked by the prospect of Trump representing the interests of Whites, who thus far have been content to be exploited as a tax-cow for the benefit of foreign and domestic parasites. The anti-Trump media offensive was described on Fash the Nation recently as a “saturation bombing,” which is an apt metaphor, as this feels like a war. It has come to the point where one questions whether we actually have a democracy if public opinion is molded with such a heavy hand, and with such sinister coordination. Rush Limbaugh, who for whatever his limitations, is quite deft at parsing media bias, opined about the campaign, “It is one-sided like we’ve never seen before, and I don’t know how to overcome it.” I had a friend from work text me this summer asking if Trump were dropping out of the race (one of the disinformation campaigns from Clinton/media), which confirmed that these smears are all too effective. We may seethe at the transparent agenda, but ordinary working people who don’t care too much about politics likely take what they see on TV at face value, and that is a little concerning to say the least. The Week journalist Damon Linker describes the familiar “wave of righteous indignation” following a supposedly offensive statement by Trump, which is amplified on social media, only to dissipate, and be followed by yet another “outrage” the next week. All these “controversies” blend together in a kind of amorphous blur if one reflects back on the last year. Linker ponders whether journalists engaged in this cycle are acting out of their sense of “civic duty” or perhaps their “moral convictions.” This is possible, because any candidate who threatens to retard the process by which America is racially mongrelized is a moral threat against the ethos to which MSM journalists subscribe. All is justified, therefore, in the quest to obstruct Trump; the ends justify the means. Whether that means taking quotes out of context, straw men arguments, or other dishonest methods is of no concern. Journalistic integrity to them is not about objectivity at the moment, it’s about stopping Trump. One hopes he is right. I gather that when the MSM attacks Trump, his supporters likewise feel attacked. Non-ethnomasochistic Whites may be starting to wake up to the fact that the MSM is against them; they should regard the persecution of Trump as their own persecution. If only we could achieve the solidarity that other groups so blithely express. My only quibble is that this is not a matter of journalists losing their reason; rather, it is a deliberate and cynical attempt to influence voters in the upcoming election, so as to effect a tangible and consequential outcome. To paraphrase Marco Rubio, we need to dispense with this notion that journalists don’t know what they’re doing; they know exactly what they’re doing. This is why the real threat to democracy is not Donald Trump, but rather an all-powerful media which seeks, in essence, to steal the election through journalistic fraud. If those seem like strong words, consider the level of collaboration between the MSM and the Democrat National Committee exposed by Wikileaks, which showed broadcasters such as Chuck Todd and Jake Tapper to be more or less taking their marching orders from the DNC. Wikileaks also implicated Politico’s Ken Vogel for submitting articles to the DNC prior to publication. So with Debbie Wasserman Schultz, Jake Tapper, DNC Finance Director Jordan Kaplan, and Ken Vogel, not to mention the legions of journalists who sought to suppress and minimize DNC leaks, you have a lot of “coincidences.” MSM journalists in general, and these people in particular, don’t care about ethics in the least, but rather pursue their (ethnic) agenda in an amoral fashion. Raimondo predicts a backlash from this media bias, as the media is “seen as a mouthpiece” of the political class. There certainly should be a backlash. The last in this trilogy of self-reflective editorials comes from the New York Times. This one differs insofar as it is not critical of the admitted media bias, but actually justifies it. It is a shameless piece written by one Jim Rutenberg, which has made waves in the conservative and alt-right media. One of Rutenberg’s major points of contention with Trump is his “coded appeal to racism or nationalism,” along with other typical complaints such as Trump’s friendliness towards Russia. With that in mind, he concludes, “It may not always seem fair to Trump or his supporters,” but attacking Trump nonstop amounts to presenting “the facts” — as though “the facts” (and which facts are presented — these same people tread lightly on Hillary’s many real scandals) are not exactly what is in dispute, and hence the need for objective journalism. Poker-faced reporters relaying “the facts” is what makes the MSM so pernicious; one needs to be politically engaged in order to see past the spin and identify the ulterior motives. When hundreds of journalists and other members of the country’s political and intellectual elite close ranks, denouncing Trump in unison and lockstep, attempting to excommunicate him from the political conversation, the voters who consider Trump their voice feel denounced and excommunicated, too. Trump’s White supporters have been essentially declared pariahs from mainstream American culture, subject to base ridicule and contempt. Yet in this divide, there is opportunity, an opportunity for Whites to achieve a clearer sense of purpose and self-definition. This will probably transpire regardless of the election outcome. But if Trump loses, we should not forget the collusion between the MSM and the Clinton campaign, and we should be bitterly aware of the dire consequences this outcome will have on our posterity.